In general most plastic parts printed on a FDM 3D printer will require some sort of post processing due to the natural striation of building up a part layer by layer, or to eliminate threads and material remnants. With most materials a quick clean with a firm bristled-brush will do a pretty good job of cleaning the part, but the striation will remain. There are special coatings that can eliminate striation, and of course depending on the resolution the part can be sanded as well. Specialized filaments, like those that are infused with metal powders, will need quite a bit more post processing than typical plastic parts in order to bring out the shine and get the most out of the material. LulzBot 3D Printers, including the LulzBot Taz 5 and the LulzBot Mini. 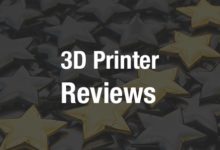 The LulzBot line of 3D printers, including the LulzBot Taz 5 and LulzBot Mini, is probably one of the best reviewed desktop 3D printers on the market today. It has earned that reputation not just because they are solid and well-built machines, but because the company that manufacturers LulzBot products, Aleph Objects, offers a ton of support materials and products for their users. Not only have they developed their own version of Cura, pre-loaded with the printing settings for some of the most popular filaments on the market, but they produce plenty of tutorials and operation guides so their users never feel like they have to learn how to use LulzBot products on their own. Parts printed in metal filament that have been hand-polished. In the latest tutorial posted to the LulzBot Learn section on their website, the Colorado-based company published some tips on the best way to polish and finish parts made using metal filaments. Because metallic filaments are made with actual metal powders they are a little heavier than traditional PLA materials, making them a little trickier to work with. In addition to LulzBot 3D printers being open source machines, they are made with 3D printed parts, so there are a bunch of easy to make modifications that owners can print for themselves. Including the Spool Mount (Modification #3) that will make using heavier filaments easier to use, and they suggest 3D printing this add-on component before using any metal filaments.The tutorial offers three different methods for polishing metal parts, each of them bringing with them their own benefits and downsides. The easiest, and cheapest, option is manually sanding the parts using sandpaper or files. While this is obviously the most hands-on and labor-intensive polishing method, it is also the method that offers the most control and will produce the best results on parts with fine details or complex geometries. Depending on the size of the object, and the amount of objects that need to be finish, hand sanding will also be the quickest way to get a nicely polished part. Unfortunately it will be messy, as there will be dust everywhere when you’re done.They suggest that anyone hand sanding start with a very coarse sandpaper with a 100 to 400 grit and gradually transition to finer grits to produce a better finish. The part will have a nice reflective surface at about 2,000 grit and will get even better with even finer grits up to 4,000 to 12,000. Parts polished using a rock tumbler. The next polishing option is the use of a rock tumbler or a vibratory polisher, which is probably the most expensive option. Tumblers and polishers aren’t exactly cheap, tumbling media can get expensive and it takes a lot longer to polish parts. A part will need to be in the tumbler for 24-36 hours, and because users have little control over the process the final finish will be inconsistent, especially if the part is too detailed. However if you have a large amount of parts that need to be polished, and they’re all fairly basic shapes and geometries, this is by far the easiest method available. And if polishing large amounts of parts is going to be a common activity, then the time and effort saved will be more than worth the expense of the machine and tumbling media. The final method that LulzBot suggests, and the trickiest method to get right in my opinion, is the use of a rotary tool like a Dremel or a bench-mounted polishing wheel. Obviously using a polishing wheel is going to produce an extremely fine finish really quickly with much less effort than hand polishing. Especially if the part being polished has a ton of fine detail and nooks and crannies that will need to be shined up. However there are a lot of risks with using a machine to polish primarily plastic parts. There is a very real risk of the part warping or melting if it is being held up to the polishing wheel for too long, and the parts can heat up really quickly so it isn’t always easy to judge how long is too long. That could result in deformations, the loss of the very fine detail that you’re trying to preserve and breakage. But with a bit of practice, a polishing wheel can also be your best friend. Polished using a rotary tool. Obviously it is possible, and probably a good idea, to mix any of these methods together depending on what is being polished. Using a rock tumbler to smooth the surface of a large batch of parts before hitting them with a hand-held rotary tool to get the details could save a lot of time and effort. But if you’re only printing a single object using metal filament, then in the long run it may just be wiser to use some good old-fashioned elbow grease and hand polish everything. And it is probably worth printing a few small objects first to test out all of the various methods and find a system that works best for you. Take a look at the entire tutorial here, it has much more information available, and includes detailed pros and cons lists to help you decide which is the best method. Tell us your thoughts on this tutorial in the Lulzbot Shows You How to Polish Metallic 3D Prints forum over at 3DPB.com.